First decline in its colossal balance sheet since 2012. An amazing – or on second thought, given how central banks operate, not so amazing – thing is happening. Bank of Japan Governor Haruhiko Kuroda keeps saying that the BOJ would “patiently” maintain its ultra-easy monetary policy, so too in his first speech of 2018 in Tokyo, on January 3, when he said the BOJ must continue “patiently” with this monetary policy, though the economy is expanding steadily. The deflationary mindset is not disappearing easily, he said. On December 20, following the decision by the BOJ to keep its short-term interest-rate target at negative -0.1% and the 10-year bond yield target just above 0%, he’d brushed off criticism that this prolonged easing could destabilize Japan’s banking system. “Our most important goal is to achieve our 2% inflation target at the earliest date possible,” he said. 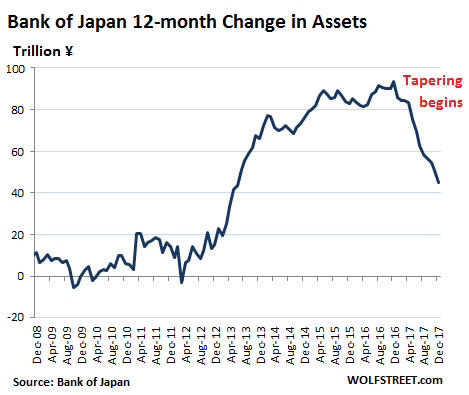 In reality, after years of blistering asset purchases, the Bank of Japan disclosed today that total assets on its balance sheet actually inched down by ¥444 billion ($3.9 billion) from the end of November to ¥521.416 trillion on December 31. While small, it was the first month-end to month-end decline since the Abenomics-designed “QQE” kicked off in late 2012. 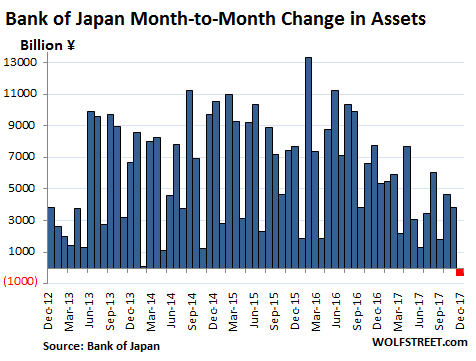 JGBs, the largest asset class on the BOJ’s balance sheet, fell by ¥2.9 trillion ($25 billion) from November 30 to ¥440.67 trillion on December 31. In other words, the BOJ has started to unload JGBs – probably by letting them mature without replacement, rather than selling them outright. None of this – neither the 12 months of “tapering” nor now the “QQE Unwind” – was announced. They happened despite rhetoric to the contrary. 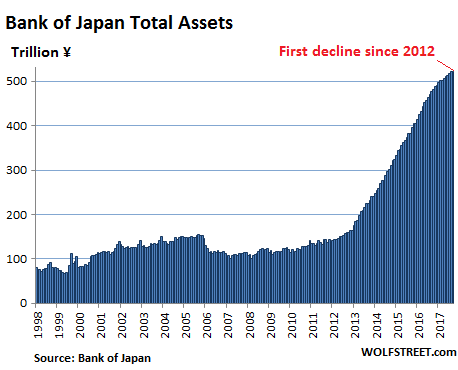 During peak QQE, the 12-month period ending December 31, 2016, the BOJ added ¥93.4 trillion (about $830 billion) to its balance sheet. Over the 12-month period ending December 31, 2017, it added “only” ¥44.9 trillion to its balance sheet. That’s down 52% from the peak. 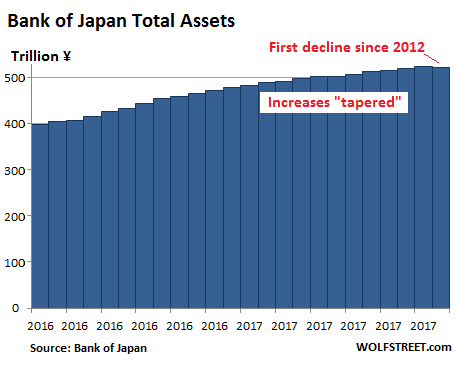 The BOJ has used QQE as an internationally accepted pretext to bring Japan’s public debt under control by effectively removing much of it from the market in order to prevent a Greek-like debt crisis. And it worked. Japan’s national debt reached 250% of GDP at the end of 2016, by far the highest in the world. Between the JGB holdings by the BOJ and by state-owned institutions, such as the Government Pension and Investment Fund, Japanese authorities now control the majority of Japan’s national debt, and there won’t be a debt crisis – though it could trigger other crises. And it appears that the BOJ decided that this might be enough control. Hence the end of QQE. The Fed leads — The Fed’s QE Unwind is really happening — and other central banks follow. The ECB began tapering in April 2017, slashing its monthly asset purchases from €80 billion to €60 billion. As of January 2018, the ECB has tapered further, cutting its monthly purchases to €30 billion. But unlike the BOJ, the ECB communicated this tapering via rumors, speeches, and finally press conferences that were spread all over the media. So the high-octane QE juice that has powered global financial markets for years is beginning to evaporate, with the ECB being the last but fading holdout among the biggest central banks.